After Mesa Arch you'll come to a junction; we're taking the right hand way, then a quick left, for our first stop at the Green River Overlook. The drive to the parking area is scenic in itself, but wait till you lose your breath at the Overlook! The informational board will give you a good idea of the sites you are seeing directly in front of you, and beyond. The river directly below is the Green River which, with the Colorado River, carved out the intricate canyons. 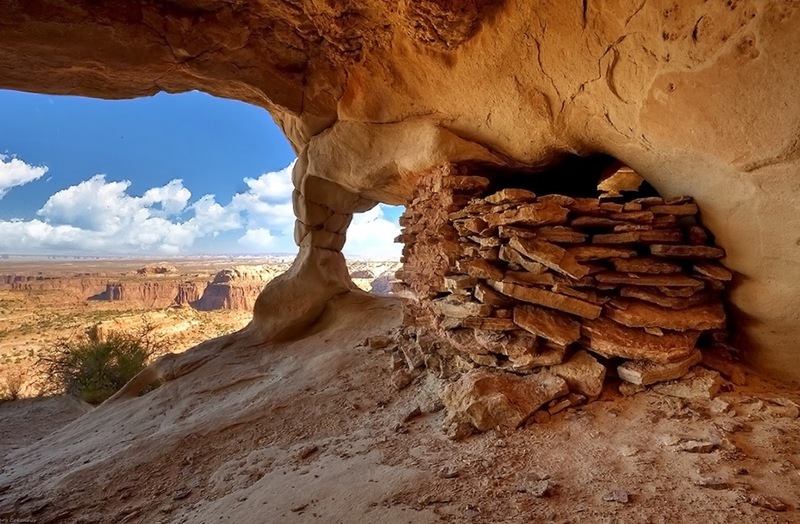 The land below is known as the White Rim; the "Mayan" like pyramid formation is Turks Head; Cleopatra's Chair is on a mesa top to the far right of the Overlook. While we were there, we could see dark clouds forming in the south, and heard thunder rumbling. The nicest thing happened while at the Green River Overlook; besides taking our own landscape photos, we helped several others by taking photos of them with the scenic view behind them. A gentleman came over to us suddenly and offered to take our photo; we're always so busy gallivanting around, or we're the only people at a location, so have very few photos of us together. We couldn't thank this man enough! After getting back on the main roadway, Aztec Butte will be coming up on the right. 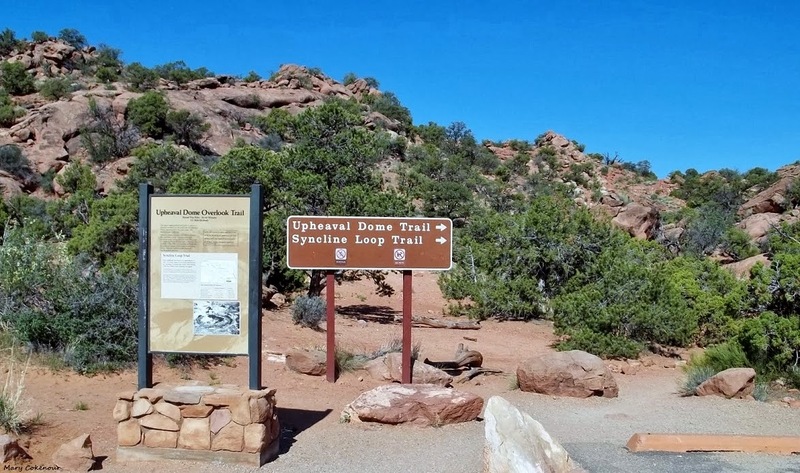 This is a 2 mile round trip hike over a primitive (non-maintained) trail; there are steep points over rough terrain; rock cairns will mark the trail, but there are very few of them. The ruin sites are granaries that are in excellent condition; the view, of course, is amazing. Back to the left side of the road and you cannot miss Holeman Spring Canyon Overlook; well, no, you cannot as it practically sticks up into the sky demanding your attention. This is about a half mile round trip walk over rocks and sand; a steep decline at the very beginning before leveling out somewhat. There is no real parking area, but enough room on either side of the road; just be careful of traffic along the road when exiting or entering your vehicle. Yes, walking out into, or standing in, the middle of the road to take photos is a bad thing! It had rained the night before, so the potholes were filled up; they were probably brimming with microscopic life, but too small for us to see. Mary on the edge, not the first time nor the last. Whale Rock is a series of sandstone domes that stretch out along the landscape; you'll have to get a distant view and tilt your head a bit to get the resemblance to the whale. It's a one mile round trip hike with, again, amazing views; but the drop offs are steep! We saw a few people walking along the top and they looked so tiny; we didn't attempt it though, just didn't feel like doing the crab walk up the steep incline. You've come to the end of this section of the Park at Upheaval Dome; a crater so huge that it can be seen from space. The crater dates back 170 million years and is 3.1 miles (5 km) in diameter; at first it was theorized that a salt dome had been pushed up due to seismic activity. 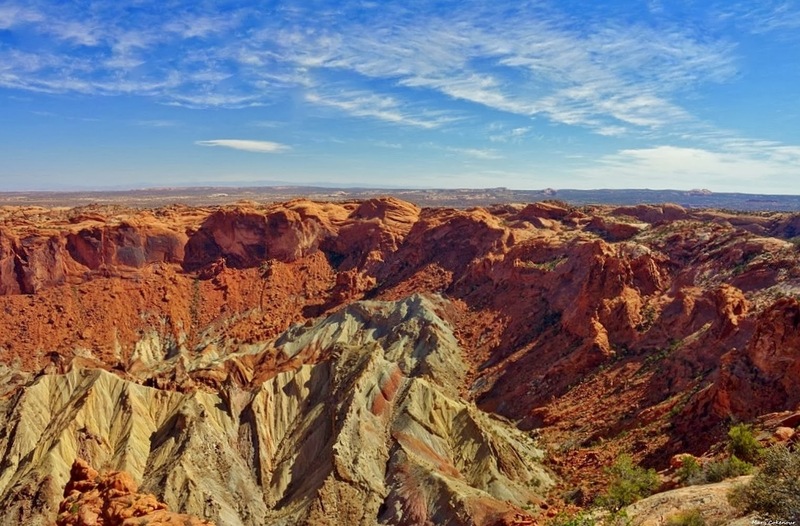 However, in the 1990s, scientists from NASA did extensive studies and proved that Upheaval Dome was the result from the impact of a meteor; 2008, shocked quartz was found which also verified the meteor theory. The trail to Upheaval has two Overlook points; the first is only about a quarter of a mile walk; the second is another 3/4 of a mile; two miles round trip for both Overlooks. 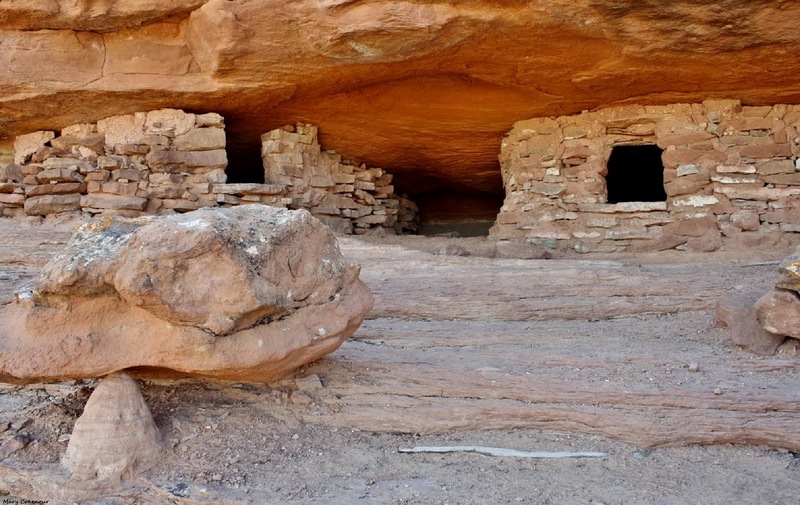 Perkins Road to Canyons and Ruins. Indian Creek Crack Gets You High. Rock Art at Both Ends of the Steel Bender Trail. Around Ken's Lake up a Flat Pass to Steel Bender. Islands in the Sky - Part Three.